Complied by Darussalam Research Division. All praise is due to Allaah, Who has blessed the Muslims and favored them by guiding them to the best of all days, Al-Jumu’ah (Friday), as their day of congregational worship. Allaah has placed many blessings and virtues in this day that are not found in other days. In performing the acts of worship that are legislated on the day of Al-Jumu'ah, the Muslim the gains forgiveness accumulated throughout the week. He comes together with brothers and sisters to be reminded of his duty to Allah and his fellow Muslims. He listens quietly to the sermon he reflects upon his own situation and his society around him. The day of Al-Jumu’ah is a day of celebration for the Muslims and it is considered an ‘Eed (Islaamic Holiday) just as the other two ‘Eeds (‘Eed ul-Fitr and ‘Eed ul-Adhhaa). In this brief booklet the author gives some very important reminders concerning the etiquettes of this blessed day of Al-Jumu’ah and how it should be received by the Muslims. He makes his points by using hadeeths of the Prophet and statements of the scholars of the past concerning the practices of Al-Jumu’ah. An added benefit is that all of the hadeeths have been referenced with brief notes concerning their grades of authenticity. 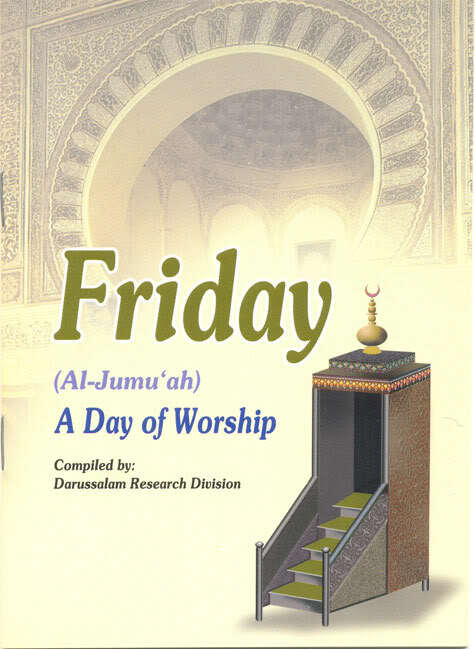 Though concise, this booklet provides needed encouragement for every Muslim to truly contemplate upon the importance of this day and what it means to the worshipper of Allaah. We thank the author Abdul-Malik AI-Qaasim, for allowing us to share the benefit of this work with our English readers. We also thank Mr. Abu Muhammad Abdur-Ra‘uf Shakir and Mr. ‘Aqeel Walker for their help in editing arid translating this work. 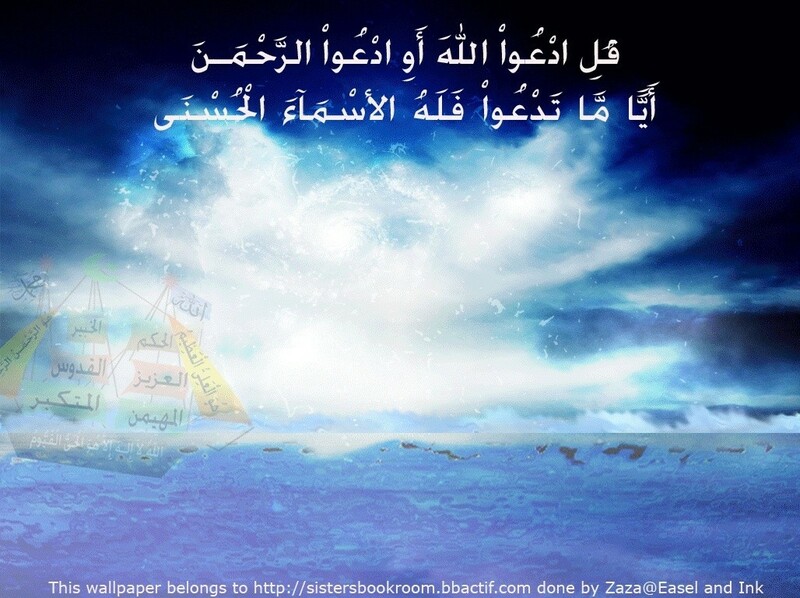 And Allaah is the Giver of success. Nations continue to celebrate their holidays and enjoy their continuous occurrences. They feel delight when the names of these holidays are mentioned. Then how about the holiday of the Islaamic community and its worship of Allaah during it? This is the great day that some of the Muslims have made for long sleeping, relaxing and taking trips. Some women have designated this day for shopping in the market places and housework. Thus, they have become neglectful of the right of this day. We must know the value of this day and its special qualities so that we may devote ourselves to worship, obedience (of Allaah), increased supplicating and praying for blessings upon the Prophet . 1. It is a recurrent holiday (‘Eed). Thus, it is forbidden to single it out for fasting in opposition of the practice of the Jews and Christians. This is also so that the servant (of Allaah) will have strength to perform its particular acts of obedience, such as prayer (i.e. Salaatul-Jumu’ah), supplications and other things. This narration was recorded by Ibn Katheer in his Tafseer (Vol. 4) in explaining this verse, and he referenced it to Al-Bazzaar and Ibn Abee Haatim. A.W. The intent here is that his fasting coincides with the day of Jumu’ah without him intending to single it out for fasting. * This hadeeth was also recorded in Musnad Ahmad, the four Sunans, Ibn Hibbaan and Al-Haakim, and it was graded authentic (Saheeh) by Shaikh Al-Albaanee in Saheeh Al-Jaami’ A-Sagheer, Vol. 2, no. 6405. A.W. * This hadeeth was graded weak (Dha’eef) by Shu’ayb Al-Arna’oot in his checking of Al-Musnad, Vol.11, no. 7050, and graded authentic (Saheeh) by Ahmad Shaakir in his checking of Al-Musnad. The difference of opinion hinges upon the narrator, Baqiyyah bin Al-Waleed Al-Himsee, who was accused of making Tadlees, in which he would claim to hear a hadeeth from his Shaikh, when actually he had heard it from another student of his Shaikh who was unreliable. 11. Giving charity during Jurnu’ah day is better than giving charity on any other day. Ibn Al-Qayyim said, “Giving charity during Jumu’ah day compared to giving it on other days of the week is like giving charity during the month of Ramadhaan compared to giving it in other months.” Then he said, “1 witnessed Shaikh ul-I slaam ibn Taymiyyah - may AlIaah bless his soul – when he would go out to Jumuah (prayer) taking whatever was in his house of bread or anything else and giving it in charity secretly (discreetly) on his way (to the Masjid). There are other virtues and merits for this great day that we have not mentioned. Even if for only one of these virtues it would suffice a man to preserve and strive to maintain its practice. So how about when it contains all of these’ great virtues and numerous qualifies that are combined in it? 1. 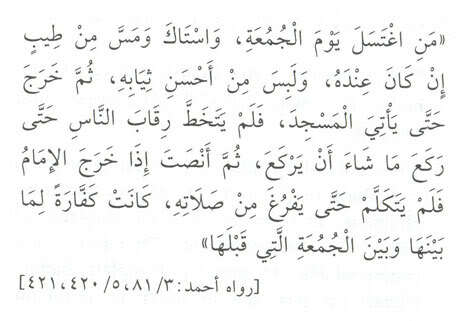 It is recommended for the Imaam to recite in the morning prayer (Fajr) of Jumu’ah day Surah As-Sajdah and Surah Al-Insaan in their entirety as the Prophet used to do. This is probably due to what these two Surahs (chapters) contain of what was and what will be of the beginning of creation and the final return in the hereafter. They also contain a discussion of the gathering of the creation and their resurrection from the graves. The reason for their recitation is not due to the prostration (contained in Surah As-Sajdah) as some Muslims think. 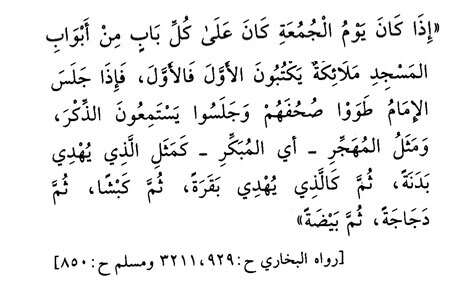 Thus, in this hadeeth the Prophet made coming early to the Jumu’ah prayer like drawing near to Allaah by giving wealth (in charity). Hence, the one who comes early to the Jumu’ah prayer is like one who combines two acts of worship: bodily (i.e. physical) worship and worship with his wealth. This is like the reward that the person receives on the Day of Sacrifice (‘Eed ul— Adhhaa). It was from the habit of the Salaf (early generations) to come early to the prayer as some of the scholars have mentioned. They said, if the person comes to it early after the Fajr (morning) prayer and before the sun rises, then that is good.” Some scholars said, “It was seen among the first generations in the early morning (before dawn) and after the Fajr prayer that the roads would be filled with people walking along the paths and crowding them going to the congregational Masjid just like on the days of ‘Eed (the two Islaamic holidays). But then this (practice) faded away.” This time was filled with obedience (to Allaah), worship, recitation of the Qur’aan, remembrance of AlIaah and supererogatory prayers. It is reported concerning Ibn ‘Umar (Radhi Allahu Anhuma) that he used to pray twelve Raka’ahs (units of prayer) before the Jumu’ah prayer. 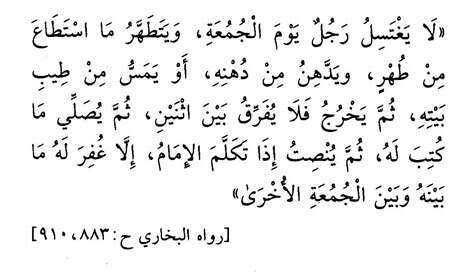 Ibn ‘Abbaas (Radhi Allahu Anhuma) used to pray eight Raka’ahs before the Jumu’ah prayer. I remember seeing not long ago that one of the worshipers used to enter Al-Jaami’ Al-Kabeer (the Grand Mosque) in Riyadh for the Fajr prayer and he would not leave until after the Jumu’ah prayer was over. From that which helps one in coming to the Jumu’ah prayer early is avoiding staying up late the night before Jumu’ah (i.e. Thursday night). It is also helpful to prepare for it from the time of early morning and not be preoccupied by worldly things. Also, striving to be conscious of the great reward and blessings that coming early contains. One should make an effort to gain the abundant bounty and numerous rewards from Allaah for coming early. 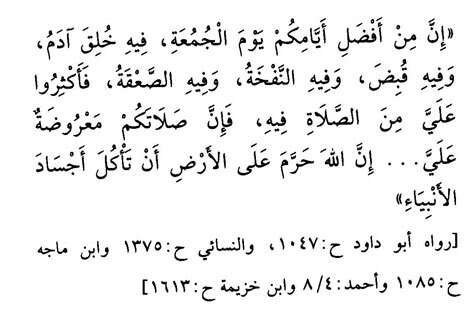 * This hadeeth was also recorded in Aboo Daawood, and An-Nasaa ‘ee, Ibn Maajah, Ibn Hibbaan and Al-Haakim, and it was graded authentic (Saheeh) by Shaikh Al-Albaanee in Saheeh Al Jaami’ As-Sagheer, Vol. 1, no. 2212. A,W. The scholars have differed concerning the ruling of bathing on Jumu’ah day, as to whether it is obligatory or recommended. The majority say that it is recommended. Therefore, it is commendable to perform complete bathing (Ghusl) on this day in order to fulfil this meritorious act. 5. Using perfume, cleaning the teeth with the tooth stick (Siwaak) and wearing one’s best clothes. Many people have become lax concerning these great Sunan (virtuous traditions) practices. * This hadeeth was also recorded in Ibn Maajah and Al-Haakim, and it was graded authentic (Saheeh) by Shaikh Al-Albaanee in Saheeh Al-Jaarni’ As-Sagheer, Vol. 2, no. 6066. A.W. It is not a condition that it has to be recited in the Masjid. 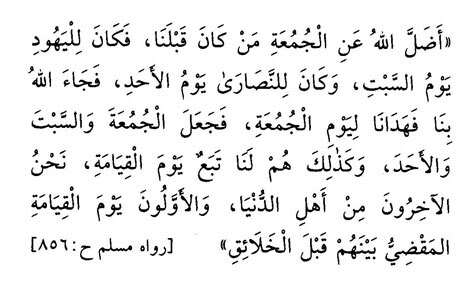 Rather, it is better to recite it as early as possible, even if one recites it in the house. * This hadeeth was also recorded in Sunan Al-Baihaqee and graded authentic (Saheeh) by Shaikh Al-Albaanee in Saheeh Al-Jaami’ As-Sagheer, Vol. 2, no. 6470. A.W. People usually do not do this (stepping over the necks of others) except for those who come late. *This hadeeth was also recorded in Aboo Daawood, A -Nasaa’ ee, Ibn Hibbaan, Al-Haakim and Al-Baihaqee, arid it was graded authentic (Saheeh) by Shaikh Al-Albaanee in Saheeh Al-Jaami’ As-Sagheer, Vol. 1, no. 155. A.W. 9. When the prayer is finished do not miss offering four Raka’ahs of prayer in the Masjid after the legislated words of remembrance (that are said after all obligatory prayers), or two Raka’ahs in your home. May Allaah make us and you of those who worship Him in the manner that He deserves to be worshipped. May prayers of blessings be upon our Prophet Muhammad his family and all of his companions.